Got a smartphone? Then get a QR-Code here and link it to your digital world. Capture the imagination of the QR-curious! 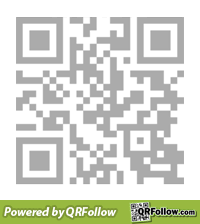 What is a QR-Code (Quick Response Code)? Try us out, create a shortcut to any wesbsite using a QRCode, no need to setup an account. Barcode yourself today, takes less than 30 seconds. To signup simply choose a username and password below plus your name and email address, everything else is optional. Add a company or organisation name to create a more corporate identity. This is a unique, visual identity to your QRfollow.com profile. Share it, print it, add it to your business card, get a tatoo or wear it on a T Shirt. Get one, today! Access more unique QRCode's once logged in that take your friends directly to your Website, Facebook profile, twitter feed and more. Once your account is created you can add more links to things like a Twitter, Facebook and LinkedIn as well as a Map. All rights reserved ©2019 - SPACESTREAM.com Ltd.